Bentley has dropped the covers on a new uber-luxurious convertible, aptly called the Grand Convertible. Bad news? It’s only a concept. With that said, we believe Bentley would be insane to not put this into production as a market for it definitely exists and the car itself looks more than ready for the road. While there is no official word on the car’s production status, Dürheimer has stated that the company is awaiting the response of potential customers and that it “will be a highly exclusive, extremely limited collector’s piece,” should it get the thumbs up. Powering the Bentley Grand Convertible concept is the familiar 6.75 litre, twin-turbo V8 engine with 530 hp and has so much torque it’s actually kind of funny. Just how much, you ask? Try 1,100 Nm of it. The ZF 8HP eight-speed automatic from the Mulsanne is the likely candidate to transfer all that power to the rear wheels. 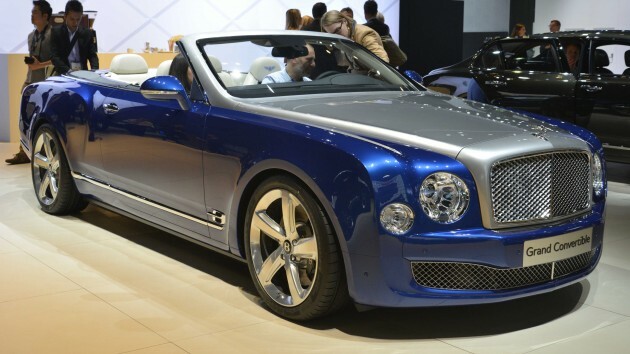 Painted in ‘Sequin Blue’, the Grand Convertible concept features a silver ‘Liquid Metal’ finish on the bonnet and windscreen frame, along with a directional wheel design – the units themselves being hand-polished to a level of finish that Bentley’s caviar-eating clients are probably used to. Step inside and one is treated to an interior comprised of 14 naturally tanned leather hides with progressive-diamond quilting. Dark Beluga leather surrounds the top of the doors and extends all the way to the back tonneau with polished chrome framing the entire layout. The tonneau itself happens to be the largest piece of wood veneer ever applied to a Bentley and is entirely fashioned by hand. The massive expanse of mirror-finished, dark-stained Burr Walnut features vertical inserts made out of chromed steel. I’ll take three, thanks. Whilst the Ministers tell the rakyat to buy Proton Iriz and Perodua Myvi, they themselves will buy Bentley, Rolls Royce and Porsche. Tun Mahathir is a great example. Bark about how good Proton is but his WHOLE family use Porsche.